Five serious and entirely preventable 'Never Events' have occurred at University Hospital Coventry & Warwickshire within the last six months. Patients at Coventry's hospital have had foreign objects left inside their bodies twice in the last six months - and one even had surgery carried out on the wrong area. 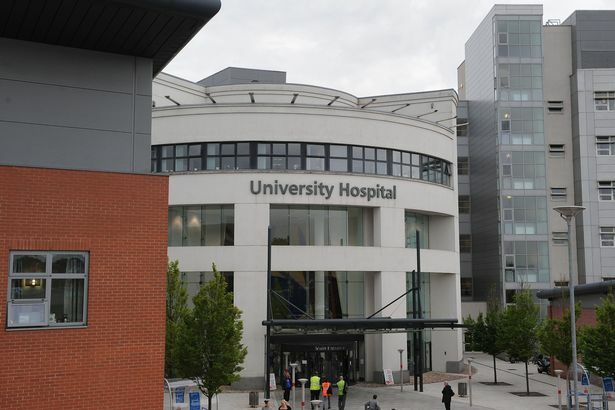 Five serious and entirely preventable 'Never Events' have occurred at University Hospital Coventry & Warwickshire within the last six months, according to a report of the hospital's Trust Board. Other incidents included two cases of medication being administered via the "wrong route". Never Events are defined by the NHS as "serious incidents that are entirely preventable because guidance or safety recommendations providing strong systemic protective barriers are available at a national level, and should have been implemented by all healthcare providers". In one case, harm was caused to a patient whereby a colorectal swab was retained and then needed to be removed. A hospital spokesman said the patient required a "minor interventional procedure to remove the swab". They added: "Due to the need for a procedure, this is graded as ‘moderate harm’ using national definitions, however there was no lasting physical damage to the patient." The remaining four incidents caused low or no harm to the patient. Each of the Never Events was investigated by the hospital. A spokesman for UHCW said: "In this case, like all the Never Events described, we discussed the error with the patient involved and/or their next of kin and offered to share the results of our investigation. "The investigations were each led by a senior clinician using Root Cause Analysis (RCA) methodology. "RCA reports are scrutinised by our Serious Incident Group to ensure that all aspects are considered and that the associated action plans are robust. All actions are monitored until completion." They added: "However we are also conscious that like all Trusts the delivery of healthcare is complex and these events are difficult to eradicate. "For this reason the Trust has a comprehensive clinical audit and assurance programme to ensure standards are maintained." Since the investigations, the hospital has introduced new procedures to try and stop more Never Events happening. The spokesman added: "The clinical operating procedure for operative counts has been amended to record that any discrepancy at the initial or final instrument/swab check should immediately be reported to the theatre co-ordinator to ensure the Clinical Operating Procedure is followed. "This has been iterated to staff through a variety of mechanisms including our Safety Huddles." The report prepared for the Trustees Board added that weekly meetings are held by the Serious Incident Group, which ensure investigations are undertaken and appropriate actions are put in place. In addition to this, on a daily basis, the Patient Safety Response Team will meet to discuss incidents and visit those patients who may have incurred severe or moderate harm. The hospital has also held a Rapid Process Improvement Workshop (RPIW) to review the process for reporting Patient Safety Incidents, such as Never Events. This focused on the online form used to report incidents and the process for feeding back the outcome. A Daily Safety Huddle for staff was also brought in to make sure learning is shared. A Patient Safety Response (PSR) team has also been created to support staff and patients involved in serious incidents. The PSR team consists of a senior doctor, senior nurse and patient safety officer who attend the area where a serious incident has occurred "and remove any immediate barriers to commencing an investigation". The hospital Trust has also implemented ‘Learning Teams’ - facilitated workshops where front line staff examine the ways they work to proactively identify potential safety issues and fix them before they lead to harm. "These [Learning Teams] are used to identify issues, errors and excellence and are now an integral component of Serious Incident investigations and allow us to use Serious Incidents as a trigger for safety improvement," a spokesman for the hospital added. A spokesman for the hospital added that the work had been carried out after partnering with the Virginia Mason Institute as part of NHS Improvement's (NHSi) ongoing continuous improvement project. UHCW chose Patient Safety as a focus area for this work, also known as a ‘Value Stream’. The work of the Trust has been recognised through being shortlisted at the 2018 Health Service Journal Patient Safety Awards in the following categories: Changing Culture, Patient Safety Team of the Year, Patient Safety Organisation of the Year.